Nine years ago, ESO uploaded its first video to YouTube, about the discovery of the first Earth-like world in the habitable zone of a distant star. It seems fitting then that a recent set of videos about the groundbreaking discovery of another Earth-like world, this time around our closest stellar neighbour Proxima Centauri, have helped boost the ESO channel’s view count to five million. Since 2007, nearly 500 videos have been uploaded to the channel, all sharing incredible astronomical news, discoveries and observations with the world, helping to spread knowledge about our Universe and inspire people. 87 ESOcasts, hundreds of interviews and observations, and countless stunning artists’ renderings have contributed to this milestone. The team at ESO would like to thank all their friends and supporters for watching, discussing and sharing the channel’s videos. We will continue to provide high-quality content for the channel and hope you will continue to enjoy every upload. 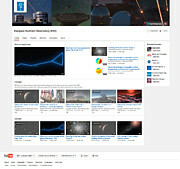 If you’d like to receive notifications when new videos are uploaded, you can subscribe to ESO’s channel here.